GOP convention held during heat wave possibly linked to global warming. Photo illustration by Phil Plait. Photos by Shutterstock/Joseph Sohm/Barnaby Chambers. You want to know the very definition of irony? While the Republican National Convention is going on in Ohio—loaded to the hilt with people who deny the reality of global warming—the country itself is baking under a heat wave that is likely amplified by global warming. 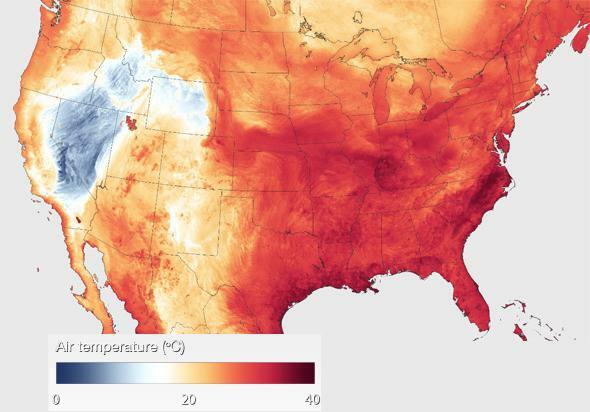 A map of the temperatures across the U.S. on July 18, using sophisticated computer models. That is a model of the air temperatures in the U.S. at 5 p.m. ET on July 18, showing what’s colloquially called a “heat dome” over about two-thirds of the country. It’s a high-pressure system that squats over an area and can lead to high temperatures. High-pressure systems have sinking air, and when the air drops down, it compresses and heats up. This is causing elevated temperatures from the Southwest to the East Coast, and elevated humidity in much of that area as well. Worse, the system is moving only slowly … which is very likely to be due to global warming. Usually, such weather patterns don’t hang out very long. But the planet is warming, and this has consequences. Warming affects the Arctic more than lower latitudes, and the strength of the jet stream depends in part on the difference in temperatures at lower latitudes to those in the Arctic. With the North Pole warming, the jet stream weakens, and “blocking patterns” can result, where weather systems move more slowly or not at all for some length of time. While it’s difficult to pin down any specific event to global warming, overall the effects of warming will make patterns like this more common, and we are seeing more of them. I don’t know that [global warming] is a resolved issue in science today … just a few years ago we were talking about global warming. We haven’t seen a lot of warming lately. I remember back in the 70’s we were talking about the coming ice age. Those are very typical and very wrong climate change denier talking points. Despite Pence’s claims, we have indeed seen a lot of warming lately, and that bit about a future ice age is just baloney. But this load of fertilizer isn’t too surprising coming from a guy who wrote that smoking cigarettes isn’t so bad for your health. 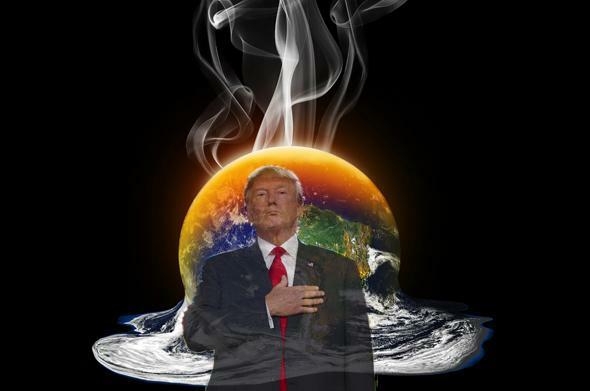 I’ll note that some Republicans do think the Earth is warming, but very few of them are attending the convention. That doesn’t surprise me; if they actually have a grip on reality, they would want to put as much distance between themselves and the train wreck in Cleveland as they possibly can. But they should remember that it’s the GOP that created Trump, and in November we should all remember the GOP candidates who deny reality. Tip o’ the gavel to Gizmodo.